Stay connected with free Wi-Fi at the pet-friendly Quality Inn Harbison where Columbia's best sights and bites are all within a short drive. Each of the hotel's 90 rooms on three floors features free Wi-Fi and complimentary local calls; additional amenities in some rooms include a microwave refrigerator flat-panel TV wet bar or jetted tub. Wake up to the smell of fresh coffee at the free continental breakfast each morning. 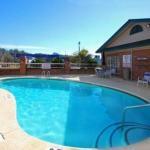 Soak up some rays by the seasonal outdoor pool and clean your duds at the on-site laundry facilities. Pets are welcome for an added fee. Just off I-26 the Quality Inn is in the Harbison district north of town. You're a mile-and-a-half from the Columbiana Mall and the movie theater and restaurants in Columbiana Station. The kids will want to ride the bumper cars at Frankie's Fun Park two miles north. Downtown attractions including Finlay Park the Columbia Museum of Art the University of South Carolina and the South Carolina State Museum are 15 minutes south. Columbia Metropolitan Airport is 11 miles south.